As promised, I am detailing my gear again - resuming with my legs. I noticed as I gathered up all my gear that I really do not have much to cover my legs. Actually, that point is not true. What I do have in gear covers my legs just fine but I do not have many articles. I guess that is a good situation. More gear is not necessarily better. Below, I sorted my leg gear by layer starting with the base and moving outward. I have three pieces of clothing for my base layer. 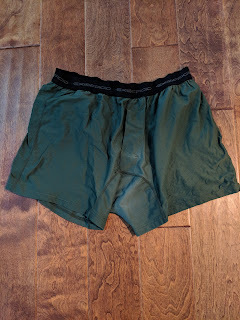 First, I have underwear (an obvious and rarely overlooked item) and that underwear is made of synthetics so I can wash them out quickly when the begin to stink. I tried Merino wool before but they tend to be too hot and, while the stink a lot less than the synthetics, they are difficult to wash/dry when needed. Underwear is an essential item that takes up little space in my pack and is the one item that I wear continuously throughout the climb. Mind you, I don't wear the same pair - that would not sit well with my climbing mates. The second layer I have on for most of the climb is my long base layer pants. Several years ago I stumbled across these base layers and I doubt I would ever return to the constantly sagging Merino wool or synthetic base layers. 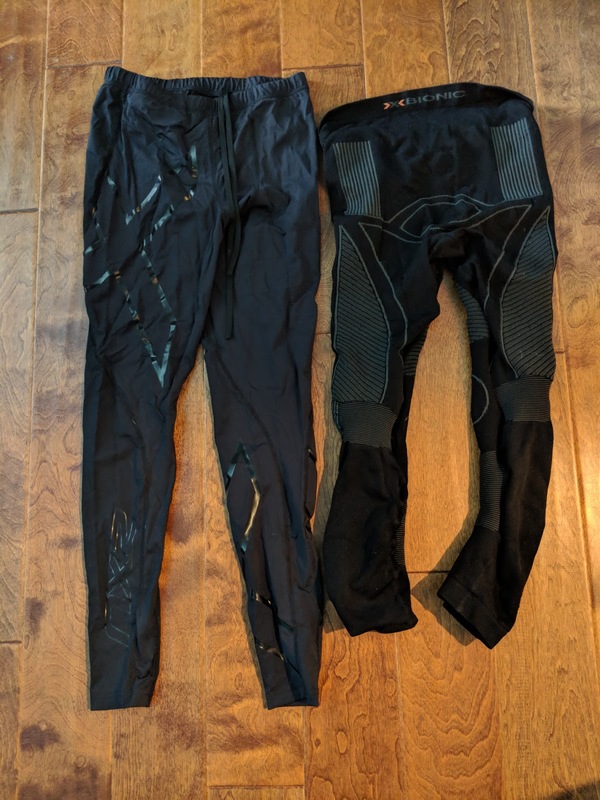 Here is a good picture (on the right below) of my X-Bionic base layer pants. They offer both compression and warmth and can be worn every day for a month and never stink - I promise. Even after a hard day of climbing where I sweat many liters, these things just seem to take in all my wonderful smells and turn those smells into something much more pleasant. You'll note that when I discuss base layers, I will constantly harp on smell. Expeditions produce rather ripe individuals and I am no exception. Best to have many redundant base layers and be prepared to clean them when your climbing mates start looking at you with the evil eye. Another important layer is my compression pants. 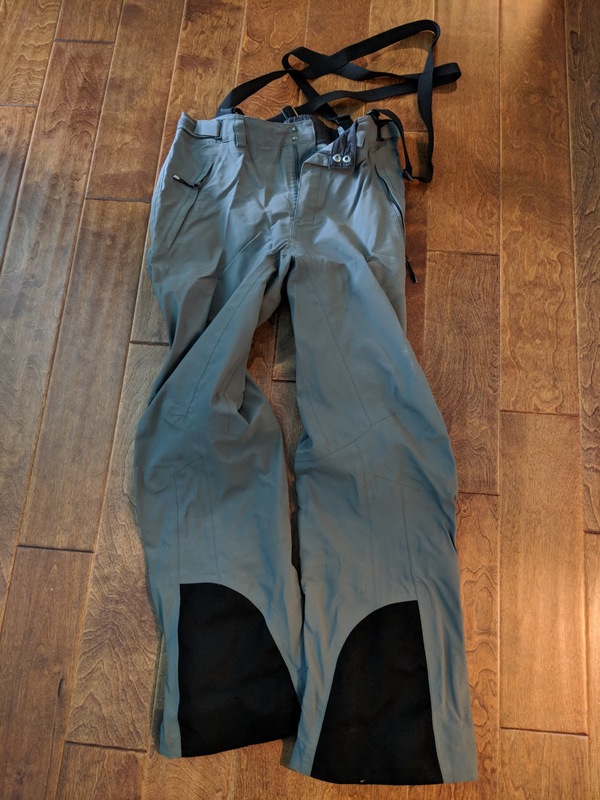 These pants help my legs recover after a long day of climbing; they really work - at least for me they do. I put these on in place of my X-Bionic pants. Compression pants do not offer much insulation but boy do they help my legs feel like new the next day. I love wearing these compression pants in my sleeping bag at night after a long, hard day. Talk about creature comforts! Speaking of creature comforts, I often wear my puff pants around camp when it is cold and windy. These pants are like walking around with a sleeping bag on my legs. I wear my compression pants under them and these on top as I stroll around trying to recover. Nothing beats a good pair of puff pants for creature comforts. You can just feel the warmth coming from these pants, right? Finally, I have my every day hard shell pants that just work. There are many different styles to choose from but these pants work and they put up with a ton of abuse. Hard shell pants are a climbers best friend. Don't worry about spending money on the "top" pants. Try them on and look for some critical features such as 1) full-length zips on each leg so you can take them off without taking off all your footwear, 2) water proof enough to keep you dry from the outside and not soaking wet from your own sweat, 3) rugged material that withstands a beating on snow, ice, and rock, and finally 4) low profile suspenders that do not cause you to have chafing marks while climbing with a pack. I purchased these GoLite pants about 6 years ago and have patched them about 20 times. They are tough and still hold out most of the water. I ski, climb, and sail in these pants - they are that versatile. Once you figure out how often you use a piece of gear, I strongly recommend you consider the cost per use. 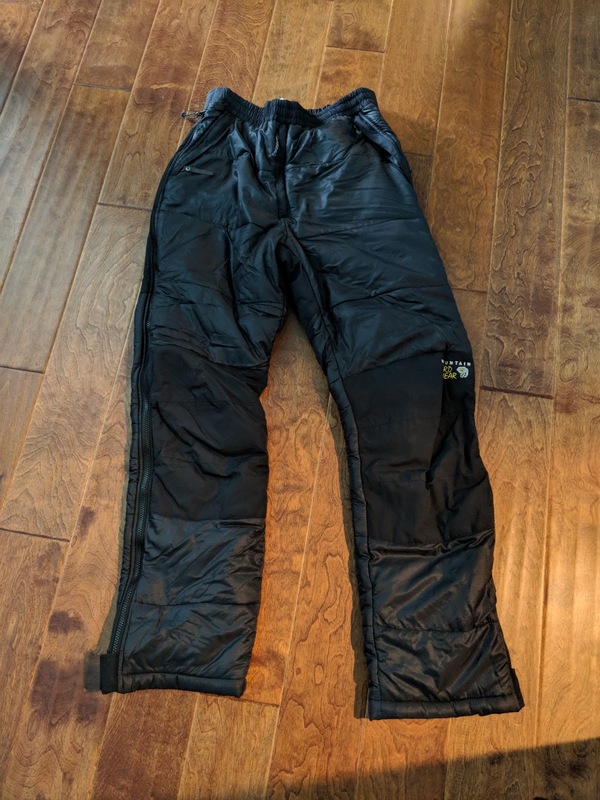 A good pair of hard shell pants may run you about US$250 but over their lifetime, you may spend US$1 per use - at least that is what I figured I would spend. These hard shell pants come in handy on most climbs and will be on my legs until I put on my summit suit. Well, that is about it! I have a few things that I rely upon almost daily and they keep my legs warm and ready for another day. Given the short time before I depart, I intend to catch up a bit and post every two or three days. Sometime this weekend, I plan to cover my upper body and then full body gear. There might be a few omissions simply because I am starting to feel rushed. Soon, I must pack all my gear - well, at least pack it after I check it, check it again, check it a 3rd time, and then figure out where it might be best packed. In the meantime, I thank you for following along with my adventure.